Dr. Costin Popescu received his medical degree (MD) from the “Carol Davila” University of Medicine and Pharmacy, Bucharest, Faculty of Dentistry in 2001 and Faculty of General Medicine in 2004. With many years of specialized postgraduate education and training he earned the title of dental specialist in Oral and Maxillofacial Surgery from the same University. 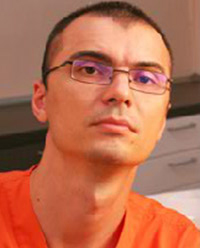 He started as lecturer at Titu Maiorescu University of Medicine, Bucharest, Faculty of Dentistry in 2005. He offers full scope of oral surgical procedures related to teeth such as surgical extractions, removal or exposure of any other impacted teeth, periradicular surgeries (apicoectomies), cystectomies, periodontal surgical procedures, surgical insertions of temporary orthodontic bone anchored appliances, dental rehabilitation via insertion of dental implants and necessary prior bone augmentations, sinus lifting.